*I’ve been waiting for years to try Culver’s ButterBurgers. When I came across the press release with info about their imminent arrival in Florida back in early May I was ecstatic. All 3 locations (Naples, Port Charlotte & Ft. Myers) are on the West Coast of Florida but that didn’t stop me from making the trek to the newly opened Naples location. The other 2 spots are still under construction. My cousin Chunktronics and I made the drive into Naples (almost 2 hours by the way) and arrived just a few minutes short of 11 a.m. During the 2 hour drive we discussed what exactly we were gonna order but once that giant menu was in front of us, it kinda all went out the window. There was no one in line behind us so we had the luxury to take our time and order. The first thing out of my mouth is “I’ll take a number 2” and the cashier takes a look at me, then looks at the menu board behind her and then back at me. Yes ladies and gentleman, I actually asked for a #2 when there is no numbering system at all. Worst of all, I didn’t catch my mistake. She was the one who told me there are no numbered meals. And then I wanted to crawl into a giant ball and roll into a river of Cheese. OK, I’m exaggerating, I took a cheap shot at myself which made her laugh so I rebounded pretty quickly. Here was our order: 2 piece Fried Chicken (Breast & Thigh) w/ Mashed Potatoes & Green Beans, Buffalo Chicken Tenders, Sourdough Melt (which I tacked on right after she gave us our total), Wisconsin Cheese Curds and a Double ButterBurger Cheese w/Crinkle Cut Fries. I stick to drinking Cola or Water with my meals but I did take this picture for those of you who are into it, Culver’s has their own Root Beer. The Fried Chicken was fried just right. The Chicken itself was moist and very reminiscent of the taste you might find at Popeye’s but not as crispy or spicy for that matter. I liked the Mashed Potatoes & Gravy but found the Green Beans to be a little too salty for me. The Buffalo Tenders were of the frozen variety with the spices mixed into the breading. They were surprisingly spicier than I expected. I made a big mistake when I ordered the Sourdough Melt. The cashier did ask if I’d like to double up the meat but I turned her down. 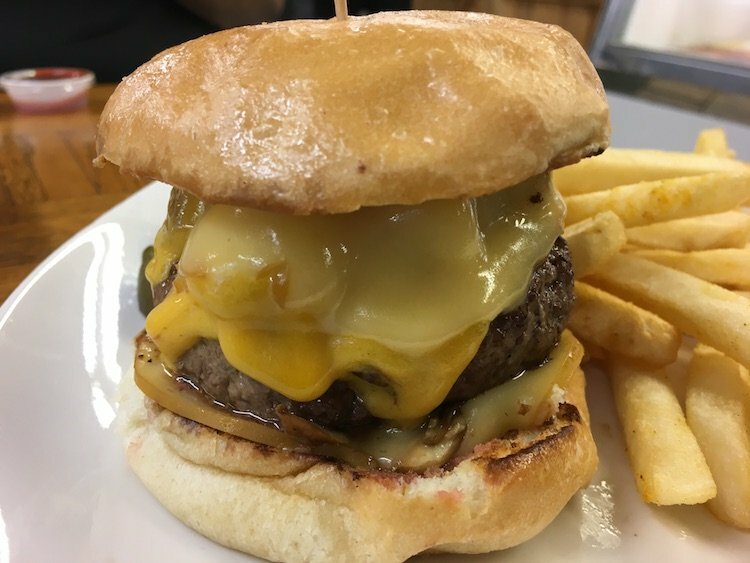 The patties are thin so a double is essential to really get a good Burger flavor out of the sandwich. Those Wisconsin Cheese Curds are deadly. They’re breaded and deep fried little balls of un-aged Yellow & White Cheddar Cheese from Wisconsin. I could pop those like candy all day, so please keep them far away from me. No for real, keep them away. This ButterBurger Cheese was a beautiful little number, take a really good luck at the crust on that Burger. The American Cheese was all nice and melty. We ordered it Double and now you could get a good grasp on that unmistakable fresh beef taste. The bun was lightly toasted with Butter which came through just a little bit. I would have definitely eaten a second if I wasn’t so full. The Crinkle Cut Fries were just ok.
We weren’t leaving without having one of their Concretes. A Concrete is Frozen Custard mixed with some sort of topping like candy or fruit. We went for a small Nestle Crunch Concrete. 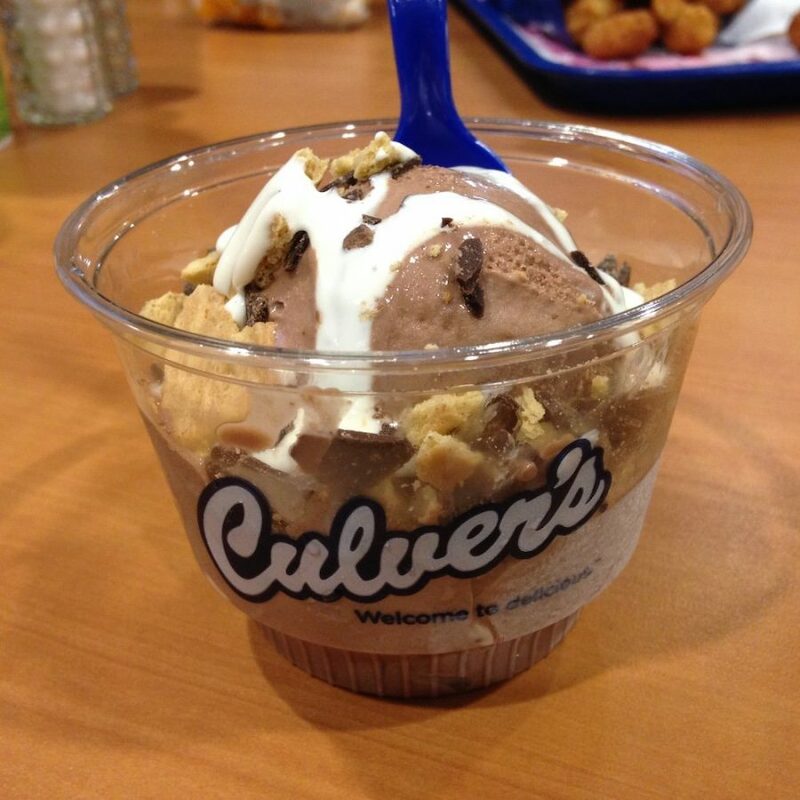 It was pretty good but I should have gone straight Vanilla for my first Frozen Custard experience at Culver’s. If Culver’s was in my neighborhood I’d definitely hit them up over any of the big 3. Hell, I would choose it over Five Guys Burgers & Fries any day of the week. Damn you Wisconsin Cheese Curds, I miss you already. *The first time I heard about Culver’s was from my late friend Spencer Block. He was from Wisconsin and mentioned, what seemed like every time we spoke that I had to hit up Culver’s and then go to a Milwaukee Brewers game with him. It unfortunately never happened. The Crinkle-Cut French fry Admirers Association looks on with ravenous eyes while viewing those wonderful crinkle-cut fries. The accompanying burger looks yummy, also, but it is merely an accompaniment to the main part of the feast fest… those awesome oh-so yummy crinkle-cut fries. Does the Crinkle-Cut French fry Admirers Association have a website or Facebook page?